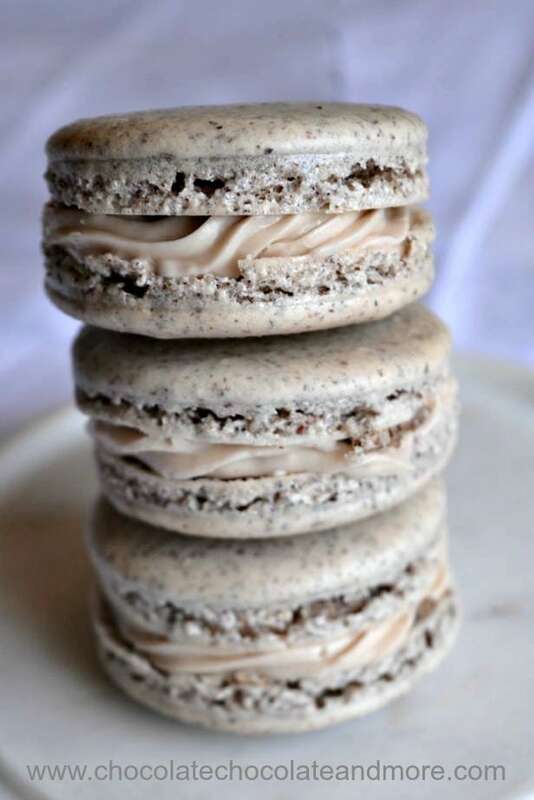 Pecan Praline Macarons - Chocolate Chocolate and More! 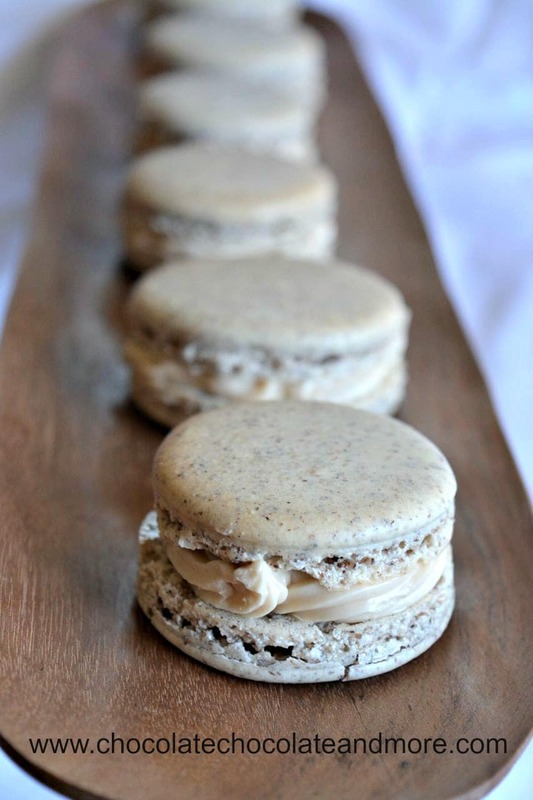 Pecan praline macarons have the flavor of a pecan praline in a light macaron cookie. They are surprisingly easy to make too. My daughter, Becky, took rock climbing as a PE class in high school. She picked it up again this semester at college so when she got home for break, she immediately bought a 1 month pass to a rock gym. Her membership came with two free guest passes so she’s been bugging me to go with her ever since she came home. A few days before Christmas, Becky fell off the wall and broke her ankle. The emergency clinic determined it was just a small chip so they prescribed pain killers and a boot. With everything closed over the holidays and insurance hassles, we were unable to get an appointment with a specialist until this week. He said she should start walking on it again so she invited me to go rock climbing again. Yesterday, Becky and I went to the rock gym here in Austin. She was really patient and showed me how to scale the “easy” routes. I made her wear the boot to protect her ankle. She scaled the routes with only one leg. Unfortunately, she didn’t show me the proper way to fall. On the last route before lunch (which was also the easiest), I jumped down and hyper-extended my knee. Now I’m in a knee brace and on crutches for a few weeks. Becky joked that we had one pair of good legs between us. Being on one leg limits things a bit so I decided on a recipe I could make while sitting (mostly). A few months ago I took a macaron class at Sur La Table. I thought they’d be difficult to make because they’re so expensive in stores. Turns out, if you can make meringues, you can make these. Pecan praline macarons are not traditional macarons because I substituted pecan flour for the almond flour in the recipe. 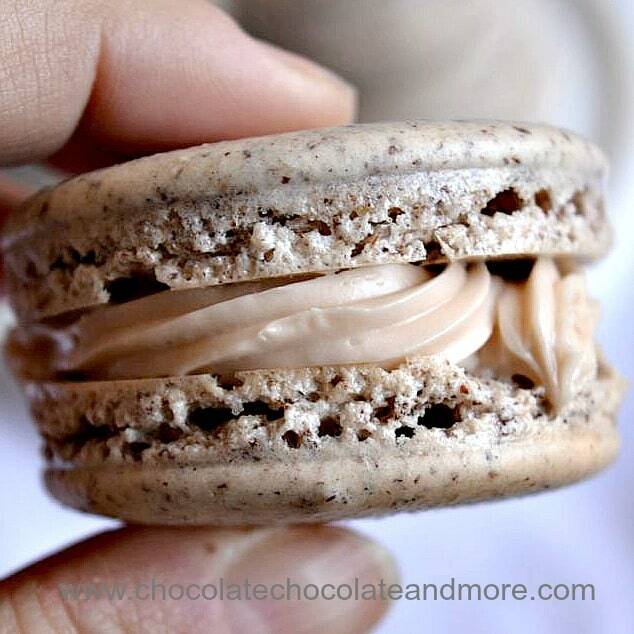 The pecan flour gives these macarons a nice nutty flavor that really complements the caramel buttercream filling. You can draw circles on parchment paper if you want uniform-sized cookies or you can use a macaron silpat. You could also use a small cookie scoop to scoop batter onto parchment. Bear in mind that the batter spreads so leave plenty of space between your cookies. You also want to remove air bubbles from inside the macarons by rapping the cookie sheet sharply on the counter before letting them dry. Letting the cookies dry for 40 minutes before baking makes a skin on the top and that keeps the tops flat as they bake. This Pecan Praline Macarons recipe uses weights so you’ll need a kitchen scale to measure quantities. I have an Etekcity scale and it’s wonderful. You can win your own Etekcity scale by entering below. 8 ounces unsalted butter, room temperature broken into small pieces. Preheat oven to 300°F and place rack in lower section of the oven. Line baking sheets with parchment paper or silpats. Make sure they fit flat on the bottom of the pan. Put pecans and powdered sugar into a food processor bowl. Pulse into a fine powder. Sift the mixture onto parchment paper to remove any large particles. Resift until all large particles are gone. Make meringue. In the bowl of a stand mixer fitted with a whisk attachment, whip egg whites on medium speed until just foamy. Add cream of tartar. Whip to incorporate. Gradually add sugar, stopping to scrape the sides as needed. Beat until stiff peaks form. Use a spatula to fold in ⅓ of the ground pecan mixture. Fold in the rest of the pecan mixture at a time. As you fold in the rest of the pecan mixture, smear the mixture along the side of the bowl. Repeat until the batter becomes shiny and flows like lava. Transfer the batter to a pastry bag fitted with a ½ inch round tip. Hold tip ½ inch above parchment paper and pipe about a 1½ inch circle. After the pan is complete, sharply rap the pan on the counter to remove air bubbles. Let macarons sit for about 45 minutes until skin forms on the top. Bake macarons one sheet at a time, rotating halfway through, until macarons are crisp and firm, about 14-16 minutes. Carefully slide the parchment sheets onto a wire rack to cool the macarons. Use a spatula to remove macarons from parchment sheets. Combine sugar, water, salt, and corn syrup in a heavy saucepan. Stir once to combine then bring to a boil over medium heat. Cook until mixture turns a deep golden brown. Remove from heat and gradually add cream. Stir vigorously until smooth. Be careful when adding cream because it will boil violently. Transfer to a stand mixer fitted with a paddle attachment. Mix on medium speed until cooled to room temperature (about 20 minutes). Reduce the speed to low and add butter one piece at a time. Beating after each addition. Once butter is added, increase speed to medium high and beat until fluffy. Pipe a small amount of buttercream onto one side of each macaron. Top with the other side. Lovely macarons! Sorry about the injuries! Thanks Christina. We’re both healing so it’s all good. It makes 3 dozen if you keep them small. Some of mine were on the large side (2.5 inch diameter) so I got about 30 when I made them. Thanks for the well wishes. I think we’ll stick with movies and hiking for bonding experiences. I’ve never made macarons before and yours look absolutely perfect. I can just imagine the rich praline taste. I am definitely making them this year! I’ve pinned the recipe. Thanks Marisa. One trick to macarons is to put the “less perfect” ones on the bottom (the chef told us to do that). Wow, these look amazing! I’ve always been intimidated to make these, maybe I will now Gayle! 🙂 Thanks for the inspiration! Pinning! I was intimidated making them too so I took the class. The tips Chef Cara gave really help. I hope you enjoy them! Hi Bobi, I plan to remake these with cookie scoops. I think it would work. The instructions I’ve seen for filling macaroons also say you can use a knife to spread the buttercream inside. The buttercream needs to be really soft (this one is when you make it) and you just have to be really careful with the cookies as they’re delicate. I hope you give them a try!